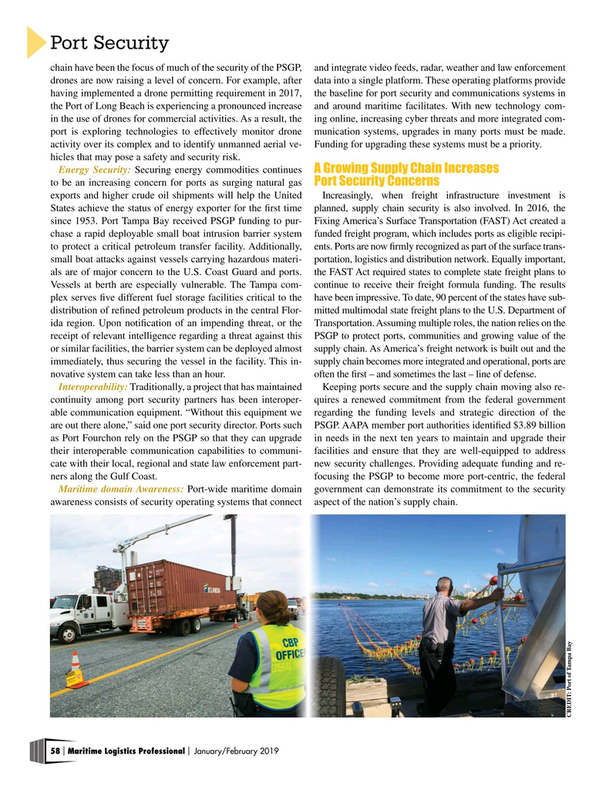 Port Security chain have been the focus of much of the security of the PSGP, and integrate video feeds, radar, weather and law enforcement drones are now raising a level of concern. For example, after data into a single platform. These operating platforms provide having implemented a drone permitting requirement in 2017, the baseline for port security and communications systems in the Port of Long Beach is experiencing a pronounced increase and around maritime facilitates. With new technology com- in the use of drones for commercial activities. As a result, the ing online, increasing cyber threats and more integrated com- port is exploring technologies to effectively monitor drone munication systems, upgrades in many ports must be made. activity over its complex and to identify unmanned aerial ve- Funding for upgrading these systems must be a priority. hicles that may pose a safety and security risk. Vessels at berth are especially vulnerable. The Tampa com- continue to receive their freight formula funding. The results plex serves fve different fuel storage facilities critical to the have been impressive. To date, 90 percent of the states have sub- distribution of refned petroleum products in the central Flor- mitted multimodal state freight plans to the U.S. Department of ida region. Upon notifcation of an impending threat, or the Transportation. Assuming multiple roles, the nation relies on the receipt of relevant intelligence regarding a threat against this PSGP to protect ports, communities and growing value of the or similar facilities, the barrier system can be deployed almost supply chain. As America’s freight network is built out and the immediately, thus securing the vessel in the facility. This in- supply chain becomes more integrated and operational, ports are novative system can take less than an hour. often the frst – and sometimes the last – line of defense. Maritime	domain	Awareness: Port-wide maritime domain government can demonstrate its commitment to the security awareness consists of security operating systems that connect aspect of the nation’s supply chain.